Yes that’s right give the little Goon in your life the best or to be more precise the best that the Chinese can make and we all know what marvellous high quality products they make don’t we? 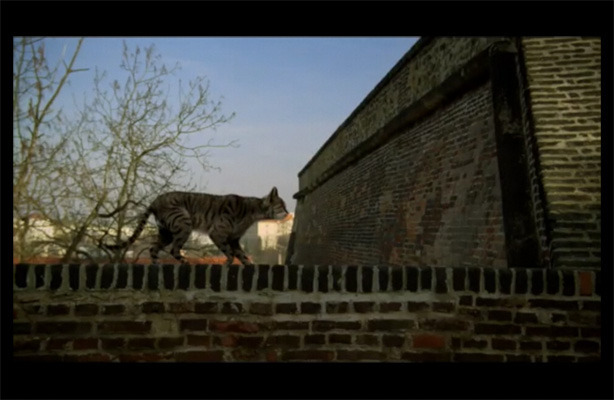 And we all know just how sarcastic The Cat can be although that fact is not necessarily related to the previous sentence! Ok so Christmas is over and now all the adverts that litter our lives have turned to summer holidays, here is a suggestion for you. I went to Manilla when writing my bestselling book ‘The Cat’s Travelogue’ and all i have to say about the place is I made it out alive! But if you happen to be with your kids in Manilla and at a bit of a loose end maybe you could do what the locals do! 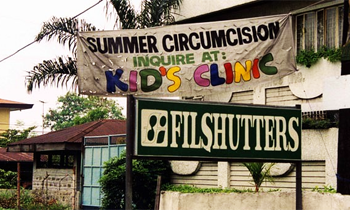 And who is Fil Shutters? Seems like a lot to take on! Does this picture finally prove just how daft some humans are? I think so! 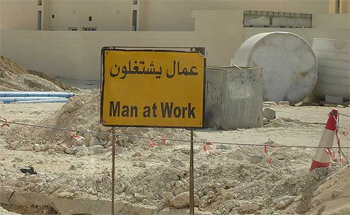 Look at the picture of an excavation site in downtown Dubai, you’d think that the Dubai government would be able to afford (with all of their oily dollars) to hire a bit of help for this poor devil struggling to dig a hole in the street wouldn’t you? Makes you wonder how many builders were employed on the rest of the big ugly buildings there doesn’t it? There is only one word for all of the above isn’t there! UGLY yes that’s the one. Backward ways in China oh and a Happy New Year too! 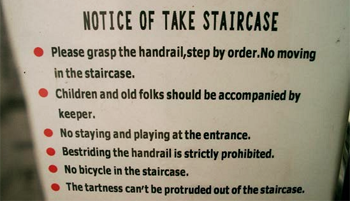 If you need to be excused please don’t try to follow these instructions too carefully! Now my dear cuddly readers if you happen to be lucky enough to live in a country that celebrates the New Year then I would like to personally wish you a very happy one, noses, head bumps and Purrs. And if you want to make this Cat’s new year a very happy one then do please visit my Kickstarter page (details below of course) and back my very worthwhile 3D animated movie project (details below again). As you can see my hopes for the new year are very high and it would be awful to disappoint such a nice Cat as me wouldn’t it? So for that reason alone you should cough up some cash now, or as I say in my bestselling first book, borrow someone else’s credit card and treat us, me because I will get whatever you can spend before you get rumbled and you because the rush you’ll get from using someone else’s credit card is similar to nibbling Chocolate or better still Prawns! And we all need a bit of excitement sometimes don’t we? Mmh I hear that this becoming the UK’s favourite, does anyone know what it is made of or is that from, is this something you eat? And if so are there any side effects from doing it. 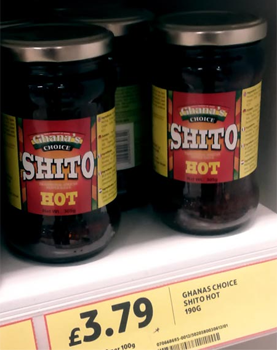 Obviously this clever Cat has his own ideas on the subject of Shito! And I am sure you have yours. Signs are, or can be helpful, but when they are really just carriageway litter they should be removed don’t you agree? 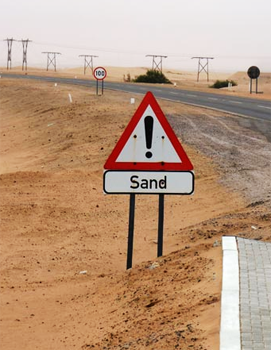 I would say it is a fair bet that if you can see the sand you can see the sign and vice versa so I wonder if the clowns in Saudi government tells us why is the sign there? Unless of course they are trying out a new sort of for sale sign for the only other resource they have when their oil runs out. 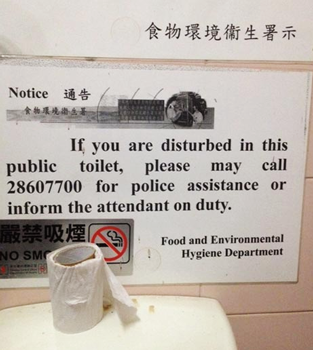 Have you been disturbed by Chinese toilets? Here is a useful public information sign slapped up on the wall of a public toilet in Beijing by the ‘Food and Environmental Hygiene Department. The only question I have about this sign is are they asking if you have been disturbed by the sign, the filth or something else? 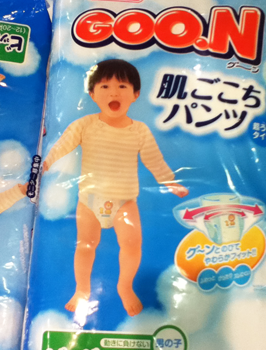 And where has that toilet roll been? Which reminds me have you been to the toilet in Russia, in the old days there was never any toilet paper because the Communists used to use all of the toilet paper for… well no one knows quite what for but there wasn’t any. Nowadays if you need toilet paper (which is an odd grey colour) you have to collect it as you go in to the stall from a dispenser in the first room you enter. Which just goes to demonstrate how ‘The Put’ and his government of Oligarchist yes men are modernising Russia doesn’t it? A double helping of coal for me please! For those of you who don’t know Malabo is the capital of Equatorial Guinea, I only say that because I was sent this picture showing a portion of a menu from one of the best Italian restaurants in Malabo. Now don’t you wish you had visited? 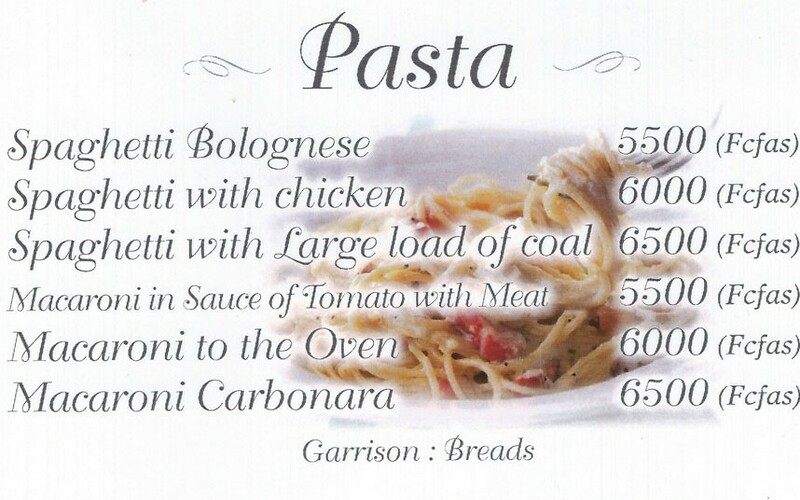 I do and really would like a double helping of “Spaghetti with a Large load of coal” please! Yum yummy! I would like to wish all of my current and future fans, readers of my blog and books a very Happy Christmas and a much more prosperous New Year! I promise you all that it will be different to everything and anything that you have ever watched and so I am afraid I have to do something that I don’t do very often and that is ask you to go to my Kickstarter page and back my project. A few dollars is just fine, but more would make this Cat very happy this Christmas and isn’t that what Christmas is all about, making people (and Cats) happy? 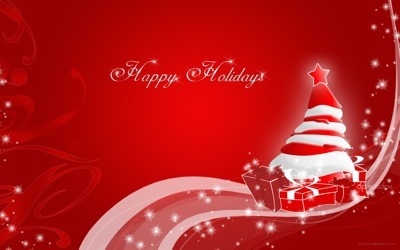 Whether you back my project or not do have a very happy time and all the best for the New Year. If you want to back it simply click here MY KICKSTARTER PROJECT or paste this link into your browser http://www.kickstarter.com/projects/1316679464/getting-out-animated-3d-short-film-trailer and go straight to my 3D animated movie project page on Kickstarter.